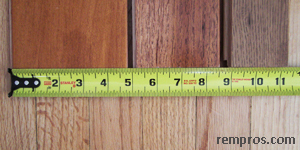 What are the standard dimensions of hardwood floor? There are different dimensions of hardwood flooring products by its width, thickness and length. Every manufacturer has its own wood floor productions line with its own specification. It doesn’t mean every product is exceptionally unique but due to variety of sizes not every manufacturer will offer complete list of hardwood floor in every possible dimensions. There some standards in which most of the wood flooring come to consumers by the type of hardwood floor. Unfinished and prefinished solid hardwood flooring are typically 3/4 of an inch thick and come in numerous of width from 1 1/2 to 8 inches. Actual wearing layer of solid wood floor is normally 5/16" or approximately 8 millimeters what makes the hardwood suitable for a few times refinishing. Most of the flooring in this category will have a random length strips or planks from 12 to 84 inches depending on product. The width of engineering wood is similar to solid hardwood and some standard sizes are analogous. Wider products are very popular because of dimensional stability of engineered wood is much higher in comparison with solid option. The thickness of actual wearing typically 1/4 of an inch but some products might be much thinner what makes it harder or sometimes even impossible to sand and refinish. Floating engineered hardwood usually comes in wider sizes – typically 4” or wider and long pieces are dominating. Many floating floors have the same length what makes possible to go with a uniform pattern during the installation. Other unique characteristic commonly used with floating flooring is an imitation of a few narrow strips on one wide plank. What the difference between strips and planks of hardwood floor? Strips usually refer to hardwood floor products with are 2 1/4 inches in width or narrower with a thickness from 3/8" to 3/4". 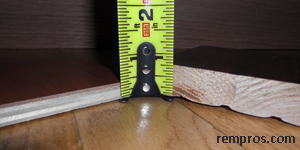 Wood flooring planks is everything wider than 2 1/4" in width with analogous thickness. What are dimensions of custom made hardwood flooring? Custom made hardwood has no standard specification. Some products can be 1” thick with up to 12 feet long or even longer; some might be 3/8" in thickness and 12 inches long. With a custom everything depends on design. Typically parquet floor comes in square shape 12 x 12 inches commonly 3/4" or 5/16" thick, but parquet flooring also available in smaller or bigger 16” x 16”, 18” x 18” or other sizes. Some custom parquet products might be 2’ x 2’, 3’ x 3’ or even bigger size. Specifications similar to solid hardwood, but 1/2” and 5/8” thickness are typical. Sizes in the chart are the most common width, thickness and length of hardwood flooring. There are hundreds of other combinations of flooring dimensions manufacturer can produce their products and looking for a specific size check particular product specifications.